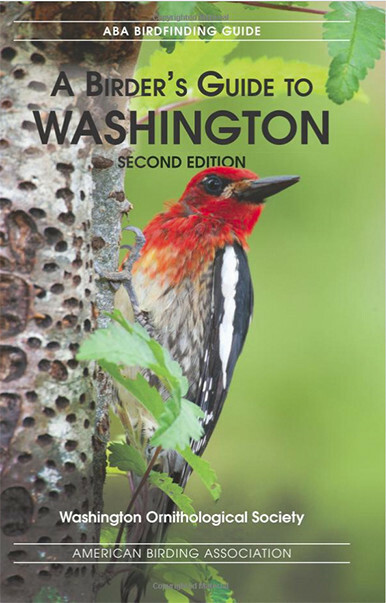 Welcome to the online version of A Birder’s Guide to Washington, Second Edition, a 613-page birding guide for Washington State published in 2015. Members of the Washington Ornithological Society (WOS) were the book authors; publisher is the American Birding Association (ABA). This website, cosponsored by WOS and ABA, is intended to be a way to update and keep current the content of the book. We encourage any and all birders to leave comments about the areas covered in this guide. Has the habitat at a particular location described in the book changed by, say, a fire or development? Have the birds seen there changed? Has a road been blocked or does it now require a high-clearance vehicle? Do you have any suggestions about when and how to bird a particular location? What’s your opinion of this birding spot? Please share your birding experiences with other Washington birders so they’ll know what’s going on at places they might want to bird! Periodically, “curators” for each of the 65 geographic sections included in the book, will decide whether the book content needs to be updated to reflect the more important and permanent changes at a location. Changes to the book text will be identifiable by strike-through for deletions and magenta color for additions. Please see our copyright statement regarding content here. Printed copies of the second edition can be purchased at Seattle Audubon Society’s Nature Shop, Powell’s Books, Buteo Books, Amazon.com, or through other booksellers.